Do you ever take a swig of sour milk and say to yourself “Gawwww, goddammit this is awful!” And then you take another swig and say it again? And then you continue guzzling, grimacing, unable to stop yourself? Because if you do, I’ll bet you’re a fan of first-past-the-post. New Brunswick’s new Premier, David Alward of the provincial Tories, has taken the legislature by 42 seats to the Liberals’ 13. Sounds like a drubbing, although the Tories had just 48.9% of the vote. Congrats to David on your tsunamic victory! NB has 55 seats in its legislature, meaning that 48.9% Tory support led to 76.4% of the seats in the House. The Liberals, while certainly losing squarely, managed 34.4% popular support, handing them 23.6% of the seats. How many ways can we spell undemocratic? This is a topical example of FPTP’s psychedelic mathematics, but it is not at all the most extreme example. What of it when Canada’s Greens take 6.8% of the popular vote in the 2008 federal election (just under one million people, or worth a city the size of Calgary), yet they win zero seats for their effort? What of the NDP effectively doubling the number of votes won by the Bloc Québécois in that same election, yet instead of being rewarded for their truly federal vision and their nationwide, 308-constituency campaign, they are indeed punished for it with fewer seats in the House? This is all old news, I know. Yet, with each swallowing, the taste does not improve. The bulk of people generally tolerate our broken system through any blend of disinterest, confusion, or suspicion that people who talk electoral reform have a trick up their sleeve, and it’s probably some kind of socialistick thing. But surely it’s not a lefty weirdo partisan perspective to look at the electoral arithmetic under FPTP and conclude that the system is patently unfair. Despite my previous entry, Labour hasn’t sufficiently listened. What are blogs for, anyway? Instead, Ed Miliband has won Labour’s leadership race. Britain’s Stephane moment has arrived. After hearing the news, I suddenly had visions of the future – of Prime Minister David Cameron with grey hair and a wizened face free of baby-fat and rich in the wrinkles of power, three terms into his PM career and gunning for a fourth, with a generation of Britons who never knew a Labour government unsure whether abandoning Cameronism would be too risky, too much of a venture into unknown territory. And Labour still looking for a leader with the panache to deliver the message for change to the masses effectively. I don’t much pity David his tragedy – he famously turned down a post as EU High Representative for Foreign Affairs last year, precisely because he had Labour’s leadership in his sights. Yet now, his high-octane Prime Ministerial ambition has run aground all the same. But he could have won this contest with a touch more sincerity, a touch more apology, and a touch less arrogance. Whatever David’s shortcomings in this campaign, he lost by less than 2%, and he is an effective Tory-eating machine. Ed, however, the comfort-food-candidate of vanguard socialists and union bosses, is the reverse – an endless resource for Tories to feast upon, to draw Labour as the political wing of militant unionism. So, “Leader Ed” – here’s hoping thou dost not squander. He may not have expected to win this contest, but win he did, and despire it all, he’ll need lessons from his loser brother regarding how to win in future. After the resignation of Paul Martin, when a dozen Liberals clamoured for the mantle of Party Leader, I will confess that I hoped the whole time that Stéphane Dion would win, and barring that, Bob Rae. I was gunning for Dion because I thought he was genuine, committed, progressive, and precisely because he was the “anti-Macchiavellian” – almost a non-politician. Of course, I learned, as the Liberal Party did en masse, that apparently you need a Macchiavellian after all. Warm ideas, leftist compassion, complex but workable policy solutions, do not go far at all if not backed (or even supplanted) by ferocity, charisma, and a bit of populism and populist understanding. I’m applying this lesson to the UK’s Labour leadership race (as I am wont to do) with its results announced tomorrow. OMG. For the same reasons I once hoped for Dion, a good part of me now hopes for Ed Miliband. Ed is the one of warm ideas, of leftist compassion, of complex but workable policy solutions. He is not ferocious, he is not especially charismatic, and he looks to me as though he’d prefer to leave the room if a heated argument began to consume it. So, I like him. But he’s too much like Stéphane Dion. David can swing a political punch, and plays off a more carefully studied understanding of populist mood. He seems almost cold for his obvious lack of ideological fervour in him, but warms up on television with a better charisma and a ruthless passion to win the argument. What he might lack in sincerity, he overcompensates for in tactics. And, at the end of the day, the idealist wing of Labour will continue to have impact on the leadership, and will continue to guide the direction of the party. So, rather than see a relatively weak character at the helm, I am doing away with an unalloyed fondness for Ed Miliband, and wishing that, for Labour to win, they will need to be tough. Canada’s Liberals are still looking for toughness, and I wouldn’t want to see Labour endure the Liberals’ recent history. In addition to that – whoever wins, David or Ed, let there please be no vindictive bitterness between them. Canada’s Liberals and the UK’s Labour both suffered from bipolar ganglandism, and to succeed, must unite – ideally with someone who can deliver a pep talk, draw a crowd, and mobilise mobilise mobilise. So, with a bit of a heavy heart – Go David Go! Here’s the missive (according to Jane Taber, as I sadly don’t receive Conservative memos) from Stephen Harper after his defeat today. How many lies can you count? Today in the House of Commons the Coalition voted to keep the long-gun registry. Twenty Coalition MPs originally supported the simple and straightforward bill to scrap the long-gun registry, but under pressure from their Ottawa bosses they turned their backs on their constituents and voted to keep the registry. I count three, which is not bad for a single paragraph. 1) there is no “Coalition.” There is only the majority of the House, and they are not coaligned in any formal way. They may end up that way, and I personally wish it. But to call the opposition parties a coalition whenever they unite around a single issue such as this is, of course, nothing but trying to invoke yesterday’s demons to stain today’s majority. 2) “Ottawa bosses.” The Conservatives love to pretend they are, somehow, the Opposition (we’ll send you there, if you want) and that “Ottawa” is a devilish spectre that we should despite and resist. Earth to Harper: You Are Ottawa. 3) the Opposition “turned their backs on their constituents.” How’s that? The NDP empowered constituents to vote their conscience and to weigh all factors before coming to the House today. The Liberals whipped the vote no differently than the Conservatives did. 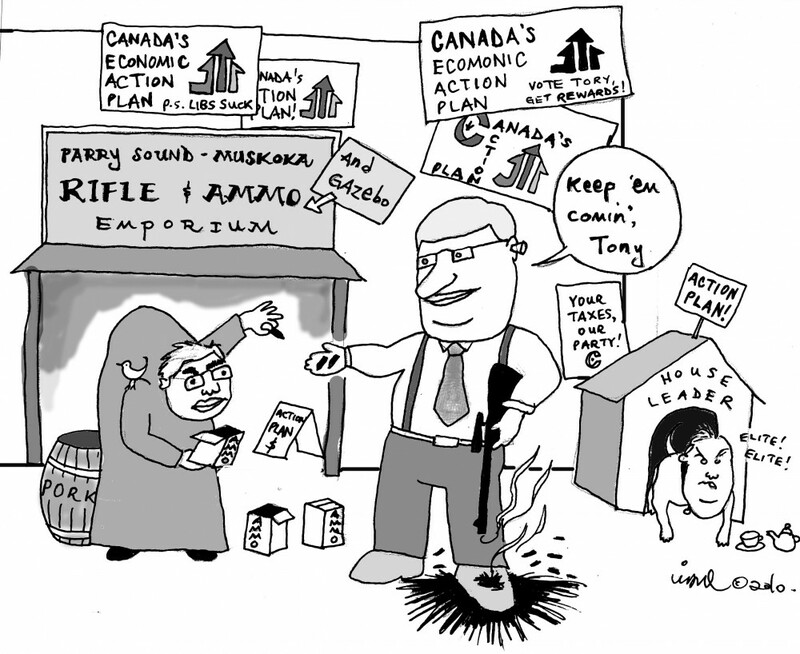 Unless Harper is right in the myth that every suburban and urban constituency the CPC holds is, in the main, behind him in his anti-gun-control zeal, then it’s just another blast of hot hypocrite air from the nether-regions of our already foul-smelling PMO. Congratulations to registry supporters for their bravery and for their long-term vision – the vote was tight, so without you, we’d have an unnecessary and harmful victory for an absolute monster of a Prime Minister. It’s good to back the police, good to back community groups against domestic violence, and good to back the majority. Say no to the Dark Side, guys! There’s Niki Ashton, NDP from Churchill. There’s Scott Simms, Liberal from Bonavista. There remain a handful of MPs, young and under tremendous pressure from the Conservative fear machine and conflicting local opinion, who seem still uncertain regarding how they’ll vote later today on the Long Gun Registry. – Harper is pouring millions into pressure groups, radio ads, and doing everything he can to make you believe your re-election depends on an outright scrapping of the registry. Don’t buy it – rural or urban, Canadians can agree that a compromise on the registry is possible and desirable, and you can vote for that compromise. – The NDP and Liberal Party are staking themselves on this legislation, in different ways. Ignatieff has whipped it, so it’s a fundamental test of his leadership. Layton has taken the persuasive, pleading route, so it’s a fundamental test for his character. If they fail in their efforts, their leaderships will be thrown into such doubt that all the gains against Harper over the summer will, I imagine, fade away. – Common sense says: it’s a gun. We register dogs, cats, cars, computer software, every day of our lives. It’s a fringe view that any of this is controversial or conspiratorial. If the long gun registry is imperfect, then it needs to be fixed. But why throw the baby out with the bathwater? Canadians, rural and urban, aren’t libertarians like a lot of the militia folk in the U.S. The great majority of us – a safe majority of us – don’t criticise the long gun registry on principle – they criticise its cost and effectiveness. Please address those concerns. – Looking beyond the registry issue itself, the great majority of Canadians are longing for an opposition with the verve, confidence, and the capacity to shut Harper down when he tries to impose legislation we don’t want. A victory today could be the springboard to exactly that energy we need to dump Harper good and proper-like on election day. Ready, aim, fire, as they say! It’s been a while since I’ve put together a political cartoon. But, as a picture’s worth a thousand words, and I think I’ve already done a thousand words on the Conservatives’ current woes and trip ups, I thought I’d draw you all a picture as a bit of a diversion. This is sort of an end-of-summer tableau, I guess. Couldn’t fit Stockwell Day in here, but maybe next time! Conservatives love to talk about “adscam.” A decade old, the scandal may be, but it’s fresh in the minds of anger-addled Cons who just can’t think of much else to say when the heat’s on them. So to learn that Harper spent $130 million on advertising in 2009-2010, a 64% increase on the year before – how might the grassroots react? Of the $130 million, more than a third was spent on Economic Action Plan signs and billboards (unsurprisingly), some of which were erected literally in the middle of nowhere. Moreover, economic stimulus is reported to have been denied to communities or groups which refused to erect these signs. For now, it’s just one more example of CPC partisan vanity, of mismatching the priorities of government writ large, and of the Conservative Party itself. Another big example in the long list of superfluous, profligate, and frivolous spending items by a government with its roots, purportedly, in fiscal conservatism. But for this proto-scandal to really erupt into something full-blown, I await news about who builds the Action Plan signs and hoardings. Hum. Perchance there are a Conservative Party donor or two involved? “Son of Sponsorship”? Ignatieff and Layton – don’t let this stuff slip! Harper is gifting you with the hammers with which to beat him. It’s interesting keeping up a blog about both Canadian and UK politics (and photos of my dinner to boot) as I come to see (or maybe imagine) all kinds of ways one scenario can inform the other. The UK’s coalition government should be mandatory reading for Canadian parties looking for insights as to how it might work, and I think the recent history of Canada’s Liberal Party needs to be studied by the UK’s Labour Party, as they get about finding a new leader, identity, and ambition. Labour’s new leadership will be announced later in the week, so for now, to the state of the coalition. If Canada one day gets a Liberal/NDP government (let’s fantasize that it doesn’t require Bloc support, please? ), how might the governing parties relate to each other? What fortunes for the NDP, as the presumed junior partner? Experiencing simultaneously the dizzying highs of unprecedented influence over government action, and the nerve-wracking lows of intrapartisan discord, as party puritans condemn any perceived sell-out, I suppose? That’s the case for the Liberal Democrats, anyway. The Lib Dems are currently holding their annual party conference. A chance to review the year that’s been, and to set the stage for that which is coming. As the first conference since coalition, I had feared it would feature a lot more wailing and gnashing of teeth, but so far the need to appear not on the edge of a collective nervous breakdown seems to be holding. Nick Clegg is making the case for party unity; faith that coalition is not a soul-selling betrayal; that the Conservatives may be big and bad but partnership is a virtue; and that the Conservative agenda is being moderated by the progressive impact of the Lib Dems in coalition. The Liberal Democrats and Conservatives are, and always will be, separate parties with distinct histories and different futures. But for this parliament we work together to fix the problems we face and put the country on a better path. That is the right government for now. People have got used to us being outsiders against every government that comes along. Maybe we have got used to it ourselves. But the door to change we want was opened, for the first time in most of our lifetimes. Imagine if we had turned away. How could we ever have asked the voters to take us seriously again? [We won’t] suffer some mysterious cross-contamination in Whitehall which means that we will suddenly warp into something different. You can share power with others and still retain your values. There is lots of commentary that NDP folks are hopefully taking notes on. Visit here and here and here for a few views. UPDATE: One can always speak too soon – there is some emerging discord at the Lib Dem conference after all. The party has voted against its leadership’s cooperation on the government’s new free schools policy. It was a non-binding vote, and won’t actually force Clegg to back away from supporting the policy (already passed anyhow), but it does come as an embarrassment for him. Clegg’s main conference speech will take place later today – curious whether he’ll acknowledge what’s just happened, or what his reception will be. Stay tuned folks. I’m like so looking forward to the newly Bairdified House of Commons. I’ve always said that what Canada needs is a red-eyed, coffee-blooded, bile-frothing hippo to set the tone of parliamentary debate. Maybe that’s unfair. But the Baird approach to public discourse does have an air of the vengeful, the angry, the destructive and the prejudiced. He’s lately labelled champions of the gun registry “Toronto elites.” That just may alienate the last gaggle of Conservatives in the city, but it also frames 1) any proponent of gun safety as a Starbuckian hipster who’s never seen a farm, as well as 2) “elites” as a vilified class, but strangely, also as the majority class. It’s the Republican Classic – portend to defend the poor on hot-button values issues, while screwing them utterly in every arena of economic policy. Galloping Beaver’s already posted much more effectively than I could on this, so I’m stealing a quote and giving you the link. This term [Toronto elites] bugs me this morning. I don’t know why the opposition parties don’t retake that term from the Cons and throw against them. The way Baird et al deploy that rhetoric against the educated suggests they’d desire everyone in the country to leave school at grade 6 lest they risk becoming an ‘elite’ of some fashion. Someone ought to ask the Cons if they’re planning to encourage kids not to finish school and strive for mediocrity and ignorance. I wonder if they’re planning anti-scholarships in order to support of the most ignorant and phobic of the early leavers as the try to feed themselves on minimum wage or less?